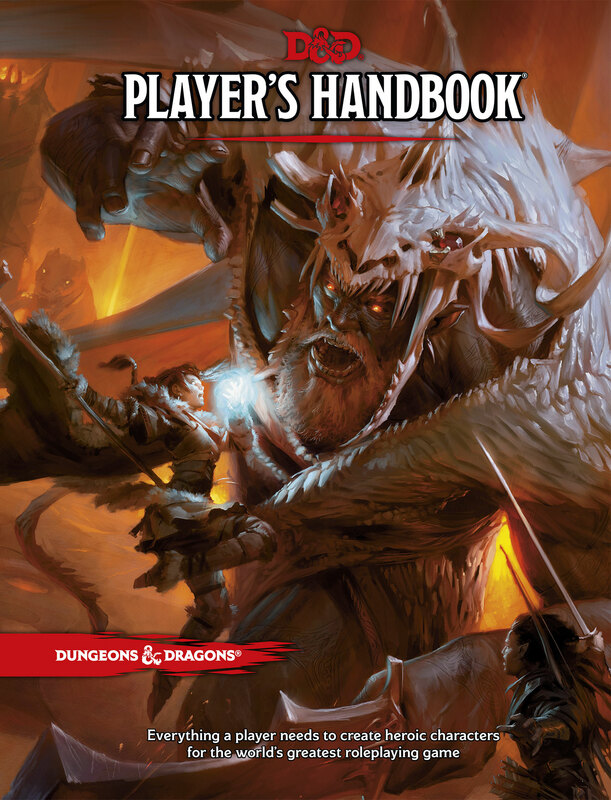 Although not officially releasing in general until August 19th, game stores in a network with Wizards of the Coast started selling the new Dungeons & Dragons Players Handbook on August 8th. Shelling out the full retail price of $50 (ok, ok, $49.95 but lets not forget tax) I have dove headfirst into the 5th Edition to help contribute to the frenzy that is 5th edition anticipation. First, don’t miss the companion YouTube video that I’ve created. You’ll find a summary and a photo gallery following the video. My first and continuing impression of the Player’s Handbook is that this is as much a new edition in terms of what fantasy roleplaying is as it is a new set of technical rules. The team behind it hopes to condition players to think outside of traditional fantasy settings and gender roles in their characters and campaign settings. It’s basically saturated with artwork and text that tries to break the mold. On many levels, this is a worthy endeavor. The question of whether they have gone too far (for example, by encouraging players to disregard traditional “binary” gender and traipsing into hotbutton social issues) I will leave to individual players. Opinions and passions will vary. Setting-wise, for me, Dungeons & Dragons is a medieval fantasy setting that basically grew out of the original designers influence of Tolkien and similar literature. I am fine with this. The very name “Dungeons & Dragons” evokes a certain theme and setting. So I’m content to play in that kind of setting. Others, however, are not and if the modern designers want to give them a hand then more power to them. The modern designers, however, are welcome to keep their female dwarves that have no beards. That’s a joke, son. Don’t get upset. There’s just no getting around it, top notch design and artwork all around. Kudos to the team and all artists involved. This is a great looking book. Two classes in particular caught my eye, the Warlock and the Paladin. The Warlock seems interesting due to the different sources of their power (not just infernal but also fey and… yes, you are reading this correctly, great old ones such as Cthulhu). The Paladin, while still on the side of good, is no longer restricted to just Lawful Good and a strict code of conduct but has three different Oath paths they may take. I have no problem with the strict alignment and conduct requirements of the traditional paladin but this new take has me pondering. This is a $50 book. Assuming the forthcoming Monster Manual and Dungeon Master’s Guide will cost the same, a complete set of the core rulebooks for D&D 5th Edition will set you back $150 plus tax if you pay full retail. I suspect that the staggered release schedule is not only to give some breathing room editorially for the designers but also to help reduce sticker shock. The combat rules appear pared down, around 10 pages. I’ve read that 5th Edition is “rules light” compared to some other previous editions and this would be in keeping with that. Saving throws now include all attributes including Charisma. Feats are now optional, and if you use them are optional. Being a personal fan of feats rules (not just in D&D but in other systems as well) this surprised me but I guess it contributes to a “rules light” goal. Keep in mind there is a full set of feats rules here, they are just optional and replace ability score improvements and certain levels. Advantage / Disadvantage The advantage / disadvantage mechanic looks to be an excellent rule to either improve or reduce dice rolls while at the same time being easy to use. Basically, certain actions, spells, etc. grant advantage or disadvantage. In which case you roll an extra d20… for advantage, take the better result, for disadvantage take the worse result. Several backgrounds are now included and encouraged that come replete with personality traits, ideals, bonds and flaws. The sample backgrounds listed include Acolyte, Criminal, Entertainer, Hermit, Folk Hero, Noble, Sailor, Soldier and more. This is a great way to encourage role playing, and plays well with the inspiration rule mentioned above. This is one of those neat rules that don’t make or break a game but make it just that much more fun. When determining your character’s starting wealth and equipment, you also get to roll a d100 on the “Trinkets” table, a fun little table full of minor yet intriguing items. Such as… a scale from a large beast, a piece of obsidian that’s always warm, or an urn full of a hero’s ashes. Just a little more creative fuel for the fire. Deities from multiple D&D campaign settings and historical periods are included. There are of course many other things to discuss regarding the new Player’s Handbook, paths to be explored and treasures to be discovered. I’ll leave you to adventure those paths on your own if you are so inclined. Thanks so much for reading and I hope you enjoy the photo gallery below. This entry was posted in D&D, Fantasy, RPG, Table Top, Uncategorized, Video on August 14, 2014 by Shane.